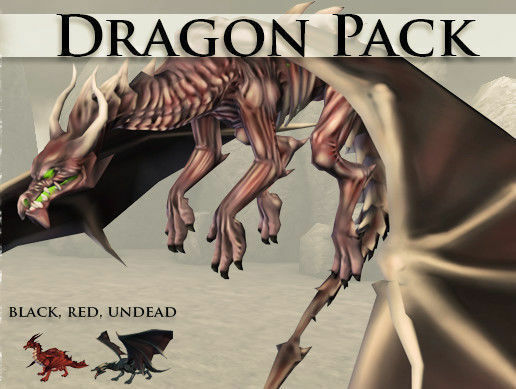 Dragon pack. Contains black, undead, and red (chaos) dragons. The dragons are a bit different in mesh too, so it is not just a texture swap. They all have the following animations: idle, walk, breath fire, bite, stomp, yawn/stretch, look around, die, fly up, flying, soaring, fly melee attack, fly breath, beginning to fall, falling, hitting the ground. The dragons each use an 1024 diffuse map, and the undead and chaos dragon have a self-illum map too. Triangle count is 4500-5000 (LOD versions are roughly half of that), bone count about 60. 3ds MAX source files included. Texture sources are not included, as I do not have them.